There is nothing we love more here at Locash than a good movement. When intelligent people get organized to right a wrong it’s a beautiful thing. Anyone can throw a rock, and sometimes that’s what it takes, but pulling off a peaceful revolution is nothing less than miraculous. 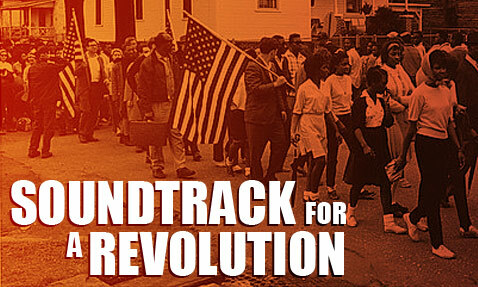 Soundtrack for a Revolution is a cultural/historical documentary that tells the story of the American Civil Rights Movement through its powerful music. These historical songs many of which evolved from slave chants and black church organizations became an important and pivotal tool in the fight against segregation. Danny Glover does an excellent job as Executive producer by collecting an incredible ensemble of modern artist to perform the freedom songs of the time. Glover captures soulful performances from John Legend, Wyclef Jean, Joss Stone, The Blind Boys of Alabama, Mary Mary, Richie Havens, Anthony Hamilton, Angie Stone and a rare singing performance from Black Thought and The Roots. Chalked full of rare archival footage, some of which is disturbing and can be upsetting at times, this is an uplifting tale told by the footsoldiers of the revolution themselves from the average protester and sit-in participants to movement leaders like a young Harry Belefonte and of course, Dr. Martin Luther King Jr. Many of the non-violent teachings and tactics of Dr.King are explained including the Woolworth’s Diner sit in’s where protesters would silently sit at the segregated diner counters until the police came and not so politely removed them, only to come back the next day and do it again, using persistence in the face of violence to prevail. Eventually running out of volunteers, black high school students started doing this on their own (against King’s wishes) ditching school and saying “You goin to Jail today?, I went last week!” it was the thing to do and helped turn the tide in Alabama. President Kennedy upon seeing footage of children being firehosed said “It made me sick” and took steps to pass anti segregation laws. The Freedom Riders was another important step which took the message out of the city’s to the less liberal rural south. The idea was to have integrated busses of black and white volunteers to ride busses together from Washington D.C. to New Orleans singing the whole way. Major resistance occurred in Alabama and Mississippi, Freedom rider organizer Hank Thomas in arrested in Jackson and given six months, after hundreds of arrests of black and white Freedom Riders the message resonated and laws were formed that public bus facilities had to be integrated. By the Time Dr. King and his activist reached Selma, Alabama where a large-scale march was planned he had found an ally in President Lindin Johnson and Dr. King’s Freedom march from Selma to the Alabama capital of Montgomery was protected by national guard units, much to the dismay of Alabama Governor Wallace. The last half hour of the film is mainly about King himself and his persistence and bravery through smear campaigns and assassination plots, which he knew about but proclaimed “I just want to do god’s will.” He fearlessly delivered his last speech in Memphis shortly after in April 1968.
i highly enjoi reading your articles my friend. good stuff. Right on Sav! make shure to send me a mailing adress when you get to L.A.